When it comes to entertaining guests, you're the host (ess) with the most (ess.) You've cooked for the boss, the prospective business clients, the snooty neighbors, and your in-laws, but when it comes to making a meal, the most important guests are the ones that are already in your house. For you, every meal you put on your table needs to be world class, and world class meals call for world class preparation. That's why everything from the ingredients you use to the tools you have in your kitchen need to be master chef quality. 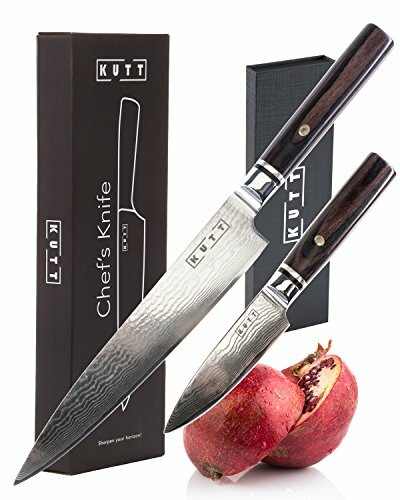 The Kutt Damascus Chef Knife Set is a professional-quality knife set that belongs in the kitchen of any chef. It consists of an elegantly crafted 8 inch chef knife and a 4 inch paring knife, both made with 67 layers of high quality pure stainless steel for unparalleled durability and performance. Razor sharp Japanese Damascus stainless steel blades ensure smooth, precise slicing with no drag and a minimum of food-stick, and the handles are made from fine Pakka wood, triple riveted with a beautiful floral design to add a touch of style to any dinner table. Kutt knows that every meal needs to be perfect, and sometimes the ones that matter most are the ones that you need to impress the least. RAZOR SHARP - The Kutt Damascus Steel Knife offers 67 layers of pure Japanese stainless steel to present rust-free and razor-sharp blades. EASY TO USE AND MAINTAIN - Razor sharp Japanese stainless steel blades for smooth cuts with no drag or food stick, easy to clean, stays sharp. INCH-PERFECT CUTS - This Japanese chef knife set can be used to chop, slice, cut or slice vegetables, fish, meat or breads with inch-perfect cutting precision. SUPERIOR GRIP - Ergonomically designed Pakka wood handle ensures a firm grip, comfort, and greater control. Stunning Asian-inspired designs add a touch of elegance. COMPLETE SET - This professional chefs knife set includes an 8-inch stainless steel cooking knife with 2.5mm thickness, and a 4 inch kitchen paring knife with 2.2 mm thickness. If you have any questions about this product by Kutt, contact us by completing and submitting the form below. If you are looking for a specif part number, please include it with your message.